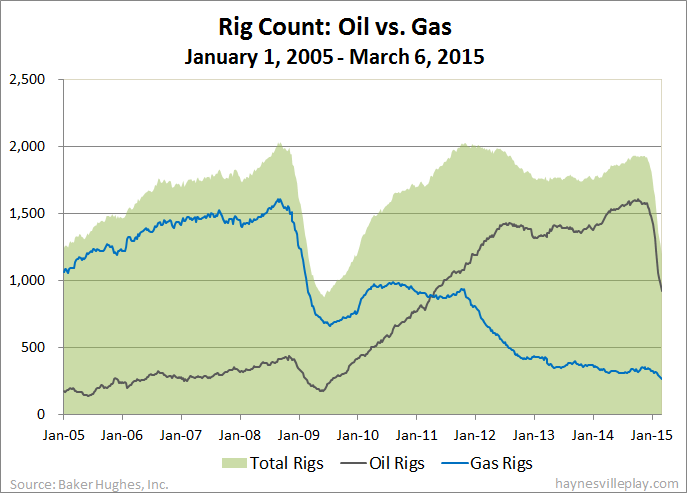 Another week, another blistering drop in rig count. Baker Hughes reported today that U.S. working rigs were down 75 to 1,192. Oil rigs were down 64 to 922, gas rigs were down 12 to 268 and miscellaneous rig were up one to two. By type, horizontal rigs were down 51 to 895, vertical rigs were down 17 to 177 and directional rigs were down seven to 120. Among gas rigs, horizontal rigs were down 12 to 198, directional rigs were up three to 47 and vertical rigs were down three to 23. This is the 13th straight week of dropping oil rigs, down a total of 653 over that period. Overshadowed by the oil news, gas rigs are down to their lowest level in nearly 23 years. The bottoming out came in mid-1992 (in March and again in June) at 242 rigs.